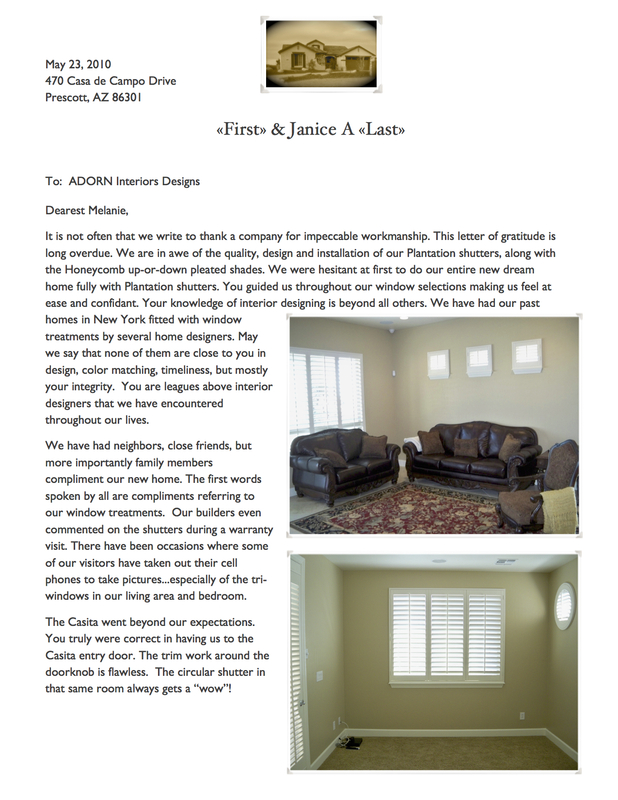 Testimonials - Adorn Interior Designs LLC. Colorado and the newest M3 office located in Eagle, Idaho. Her talent with exterior colorization and design can clearly be seen in the M3 projects on which Ms. Roselle collaborated. In addition, her eye for the architectural review process has been a benefit to our American Ranch and Prescott Lakes communities. We look forward to working with Ms. Roselle in the future and are pleased to recommend her for interior design and exterior colorization projects. Apria Healthcare needed to install new carpet in our Prescott, Arizona location. We were told by our Bentley representative that ADORN Interiors would be able to work with us. 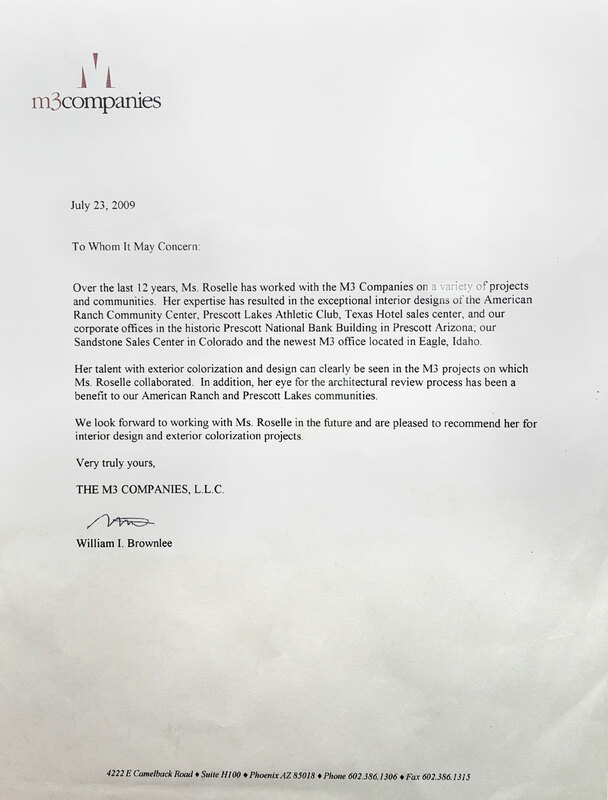 Melanie Roselle contacted me and went to the site that day to work with the local staff. 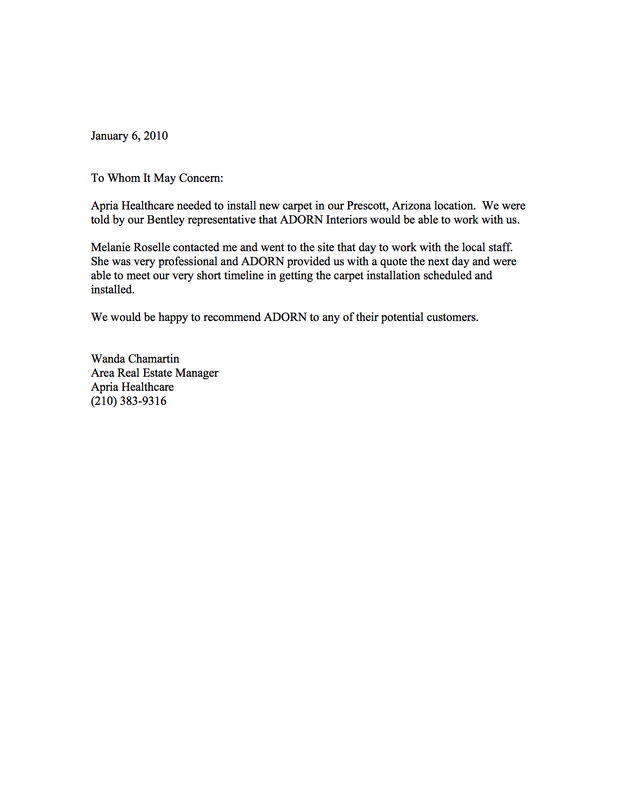 She was very professional and ADORN provided us with a quote the next day and were able to meet our very short timeline in getting the carpet installation scheduled and installed. We would be happy to recommend ADORN to any of their potential customers. We have had neighbors, close friends, but more importantly family members compliment our new home. The first words spoken by all are compliments referring to our window treatments. Our builders even commented on the shutters during a warranty visit. There have been occasions where some of our visitors have taken out their cellphones to take pictures..especially of the triwindows in our living room area and bedroom. The Casita went beyond our expectations. You truly were correct in having us do the Casita entry door. The trim work around the door knob is flawless. The circular shutter in that same room always gets a “wow”! We were unaware of your skillfulness when we were referred to you by a community neighbor. We now know why the community of Prescott Lakes Golf and Club selected you as their interior consultant and designer. I hope this letter of thanks relays our sincere gratitude for making our home more beautiful than we ever imagined. We forgot to mention your pricing was unmatched for the quality we received. Also, kudos to your installer! Fell free to use our letter as a reference. We are looking forward to having you aid us in furthering the interior design of the rest of our Prescott Lakes home. It is my honor to write this letter in support of the fine work that Melanie Roselle has provided to HOAMCO (Homeowners Association Management Company) for the last 7 years. During my association with Melnaie, I was impressed not only with her attention to detail and eye for colors, but also her professionalism and positive attitude in working with others. She continues to provide excellent service for some of our finest master planned communities, such as Prescott Lakes and American Ranch. I look forward to our continued relationship in providing excellence to community associations. I furthermore would recommend her services for residential projects, both exterior and interior design.